Insurance is one personal finance topic that often gets glazed over. I’ll be the first to admit, insurance is not always exciting. Nobody checks their insurance statement each month with the same kind of excitement or hope they do with savings or investing statements. Even though insurance isn’t the most exciting part of a financial plan it is absolutely one of the most important. After all, what’s the point of working so hard for financial stability and eventually financial independence if it all can be torn away in a moment’s notice? You need to protect yourself and your family so that the work you’ve done is insured and that your family is left with financial resources should something happen to you. 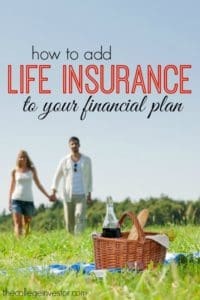 While there are many types of insurance that should be incorporated into your financial plan, today we’re going to talk about term life insurance, why you need it and how to get it. I’ve never viewed life insurance as a traditional investment. In fact, I think investing in a whole-life policy is usually a bad idea (there are more effective ways to invest your money.) Instead I opt for term life insurance. If you’re not familiar a term life insurance policy is a contract that pays a specific amount of money upon the policy-holder’s death. Term life insurance is very affordable and is guaranteed for an agreed upon term. Whole life insurance, on the other hand, is a bit different. A whole-life insurance policy offers a death benefit but also has an investment portion to the policy. The one advantage of whole-life is that as long as contractual obligations are made (you make the payments) the policy never expires. I prefer term life insurance for its simplicity and affordability. But there are a few things you should be aware of before taking out a policy. Go for a longer term – If you get a shorter term policy, say ten years, and during those ten years have a major health problem your rate upon renewal could skyrocket. Even worse, you might get turned down altogether. Even though choosing a higher term, like 30 years, may cost you a bit more than the 10 or 20 year terms it could save you a bunch of money in the long run. Make sure you get enough coverage – Looking at large sums when selecting coverage can feel a bit overwhelming. I mean, will your family really need $500,000 if something happens to you? They might. When considering how much coverage you need you should factor in your debt, your current income and any future goals you have. To come up with a good figure add up your current mortgage balance, debt obligations, future obligations (like sending your kids to college) and your yearly income multiplied by the number of years you’d like to replace it. While it’s unlikely that you’ll predict the exact amount of money your family will need it’s better to be over-prepared. And on that same note something is always better than nothing! The sooner you get coverage, the better – In general term life insurance rates will increase as you age. If you’re looking to lock in a good rate you need to get coverage now. Not to mention the fact that you have no idea what the future holds, it’s better to take out a policy sooner than later. If you don’t already have a life insurance policy taking one out is fairly simple. If you’re in good health you’re also likely to find that getting term life insurance is very affordable. One company we’re working with in regards to quality insurance is SelectQuote. SelectQuote has been around for over 30 years and they only work with life insurance companies that have earned the highest rates from A.M. Best. When you opt to get a quote through this agency you’ll be able to get the best rate from a solid life insurance company. You can either call or request a quote online. Of course, I tested it out and found that the quote process was very simple. If you want to get a quote online simply follow this link. You’ll be asked about a dozen questions ranging from height and weight to simple multiple choice medical questions to the level of coverage you’d like to have. The whole process took me less than five minutes. At the end of the short questionnaire you’ll fill out your contact information and an agent will call with your quotes. (It says that an agent will call you within 24hrs. I received a call within a half an hour.) Getting a quote in no way binds you to getting a policy. Insurance is such an important part of a solid financial plan. And life insurance is doubly important if you have family who depends upon you financially. I know, getting insurance can feel like a pain but it’s something you only have to do once and then you’ll be done. If you don’t have insurance I highly recommend that you look into getting covered today. *This article was sponsored by SelectQuote, but all thoughts and opinions are my own.